Every so often a seal or penguin gets lost, and for some reason heads up Taylor Valley. In my hikes I’ve come across a few seal vertebrae and skua bones. 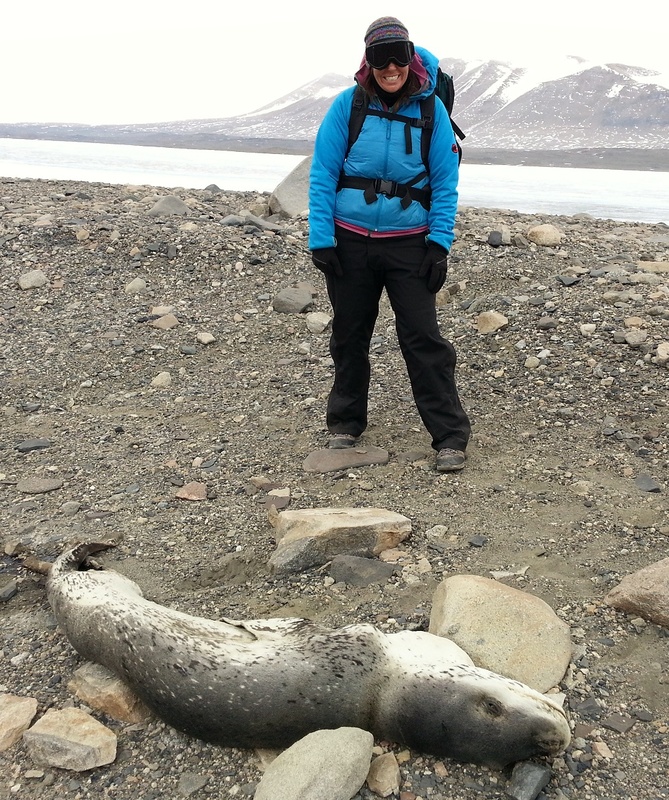 But here by Lake Fryxell, Renee from Lake Hoare shows off an exceptionally preserved specimen, perhaps a year old: the leopard seal. 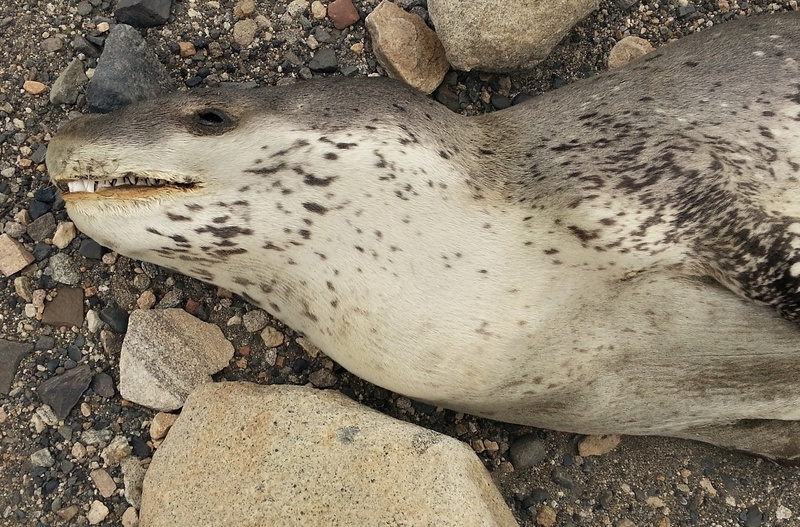 Leopard seals are exceptionally aggressive predators. Solitary beasts, they are rare to find in the wild, let alone a stray one. They eat fish and penguins; look at those teeth. Their teeth can also lock together to strain water for krill. 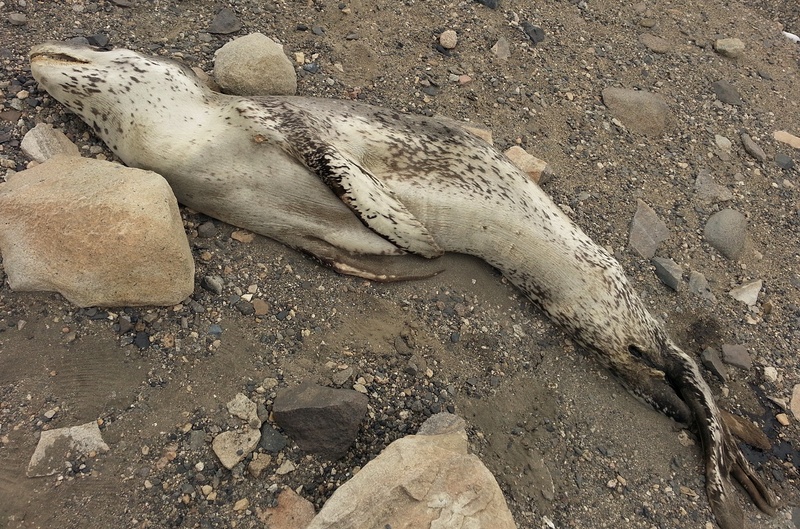 The position of the dead seal shows that it died desperately pointing west up the valley, away from the sea about ten miles behind. You can see from this map where the seal was found (red arrow) and the direction to the sea (blue arrow). Upon reflection, the seal offers scientists a cautionary tale. No matter how sure you are that you’re heading in the right direction, always listen carefully in case you’ve missed the point. 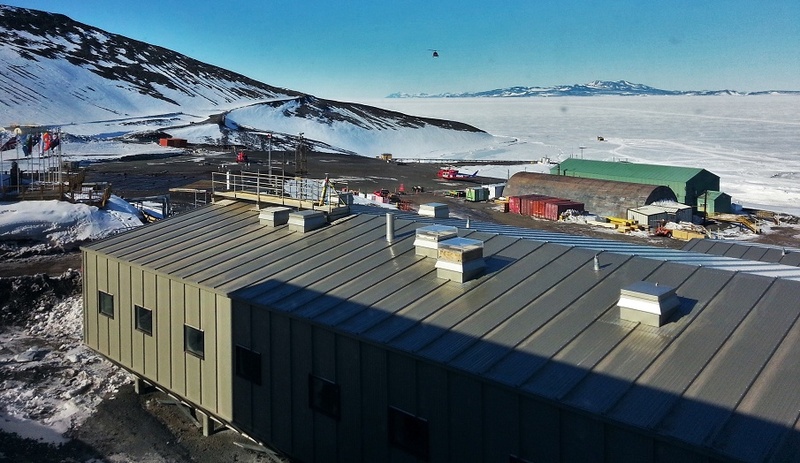 Well it’s time for Rachael’s science team to decamp to McMurdo, helos full of loot (microbial samples). The equipment is packed, the stove turned off. This will be another three-helicopter day. Meanwhile, I take a short hike to remember all the cool parts of this valley. The grooves of patterned ground. 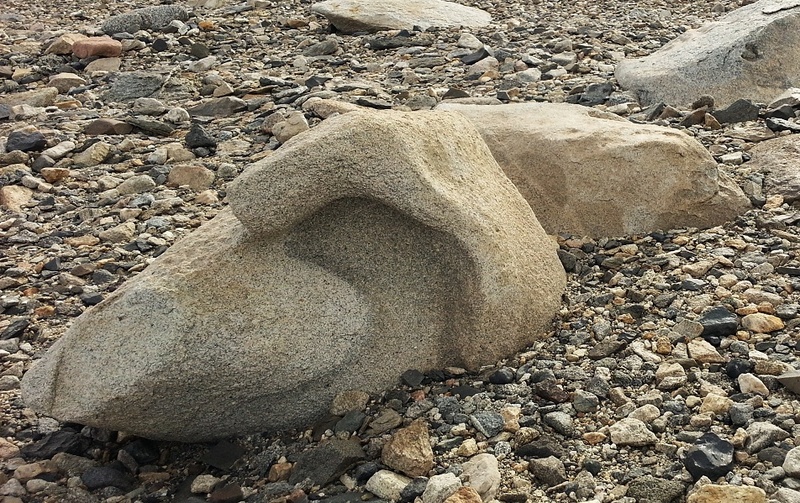 A ventifact, a deeply windswept rock. 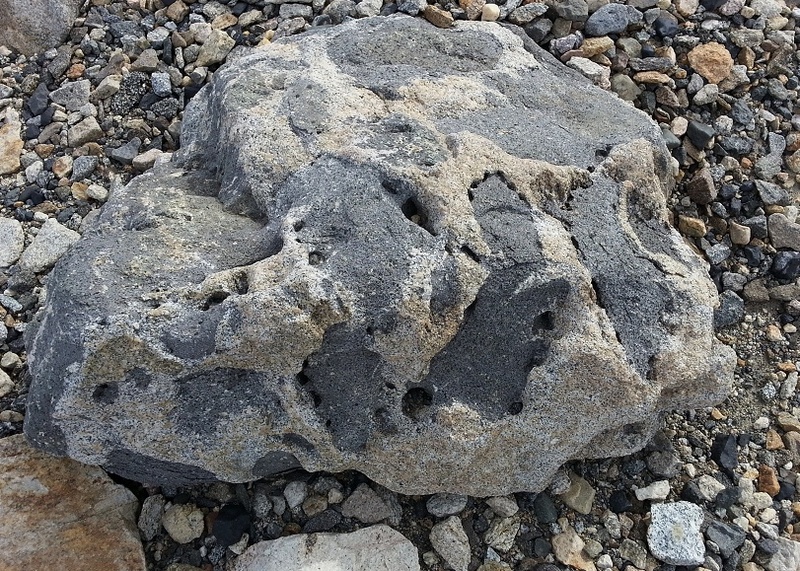 A volcanic rock full of bubbles. 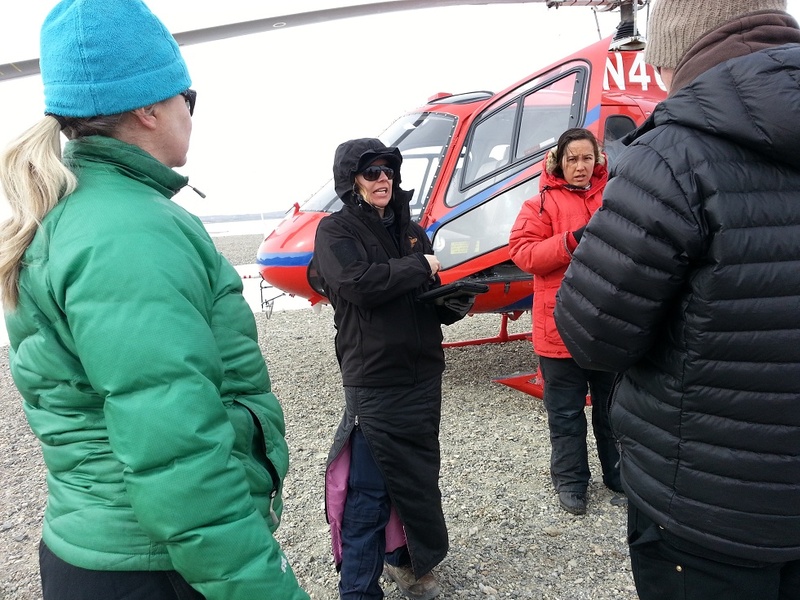 The first helo shows up, an A-star with Shelley, a woman pilot. Way cool. My clothes bags get packed into the side basket. Yes, it’s a bit unnerving. All our boxes and samples got packed into #2, then the four of us rode home in an A-Star. The pilot offered to show us penguins on the edge of the Ross ice shelf. All our cameras came out, as the helicopter dipped close. 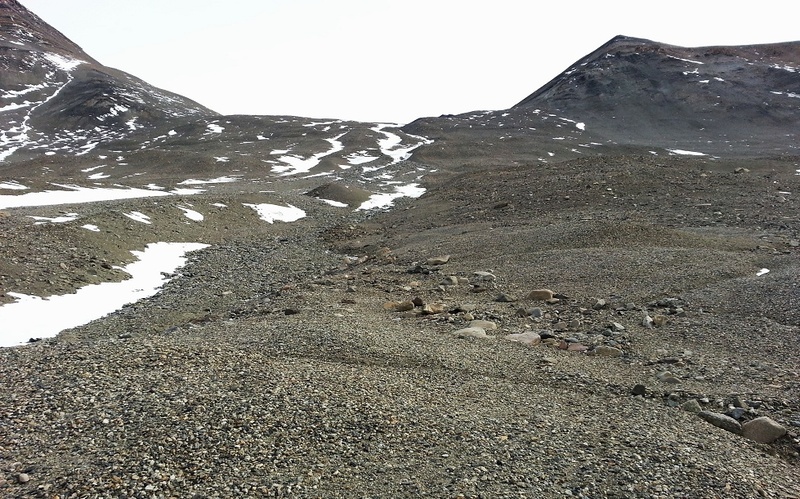 They were too far for my camera, but we saw several colonies of Adelies and of Emperor penguins. The penguins waddled away, flapping flippers, just like an Attenborough documentary. A great end to our field season. So where did all our samples and equipment go? 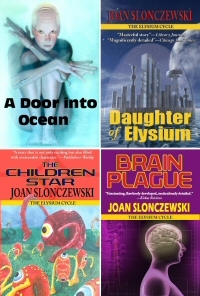 Back to the Crary Research Laboratory. The Crary lab has an unusual structure, for several reasons. Its primary function is to process field samples and ship them out. 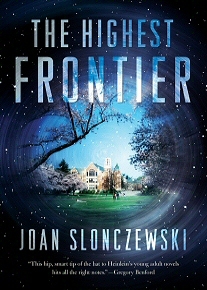 Researchers also conduct experiments on samples that cannot wait. 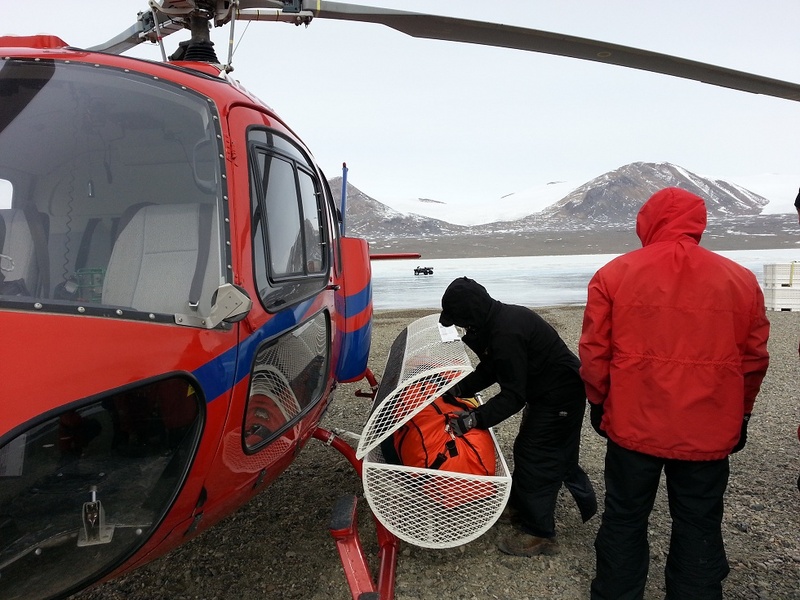 But for our team, the main priority is to get our sample microbes home alive before the holiday “blackout” period. Note the helo staging area, conveniently situated downhill. Crary has three “floors” but no elevator. 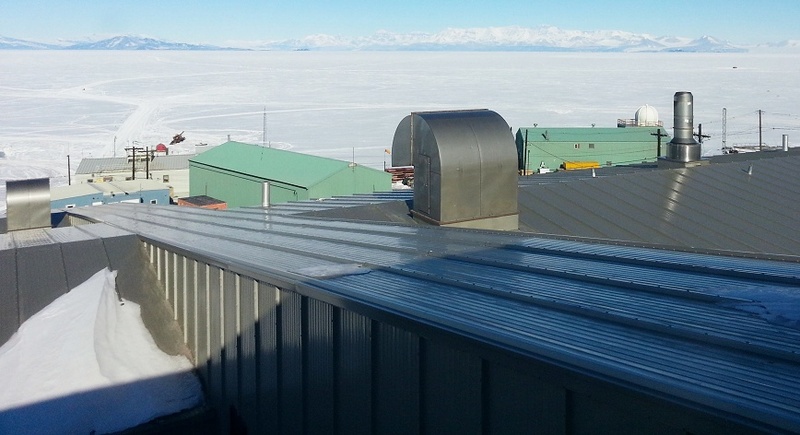 From what I understand, McMurdo buildings have no elevators, because if they break down out here they could not soon be fixed. So Crary’s three “floors” are actually three distinct buildings, situated downhill; the higher numbers go lower. A long ramp connects all three floors. So you can wheel a cart full of gear easily all the way downhill, almost right to the helipad. The third floor (downhill) is a wet lab where divers bring in their latest catch from the sea. The Ross Sea under the ice boasts an enormous variety of exotic fish and invertebrates. Often the invertebrates grow to unusual size, defying the expectations of divers trained in the tropics. 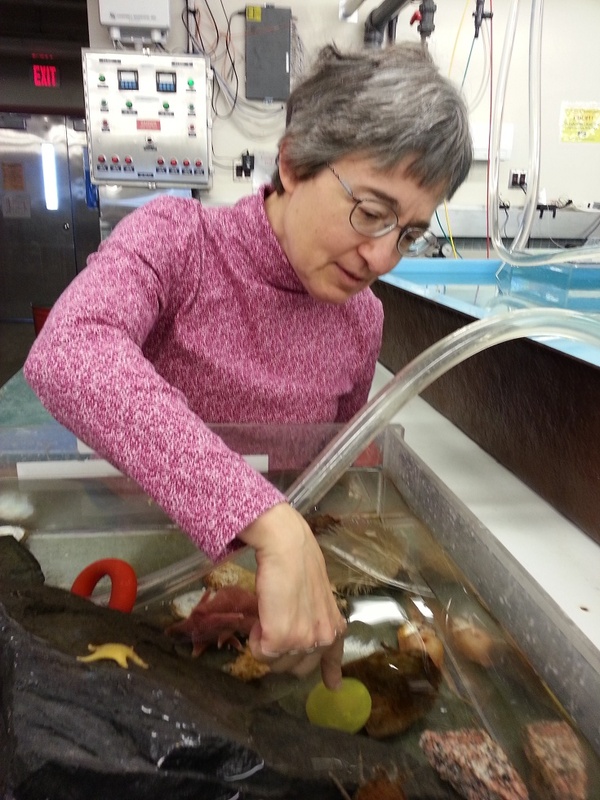 Some of the daily catch is brought to the Touch Tank, a tank of wildlife for exhibition and outreach. 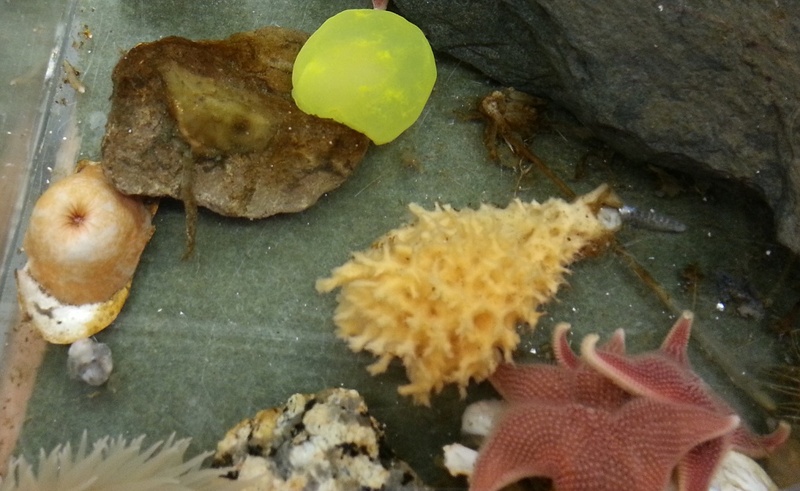 Here we see a sea lemon (slug-like invertebrate animal), anemones, and two starfishes feasting on a clam. The Touch Tank is so-called because visitors are allowed to touch the creatures within. So of course I had to touch the sea lemon. Who dives for these creatures? Mainly scientists studying the populations, physiology, and behavior of these amazing cold-adapted life forms. 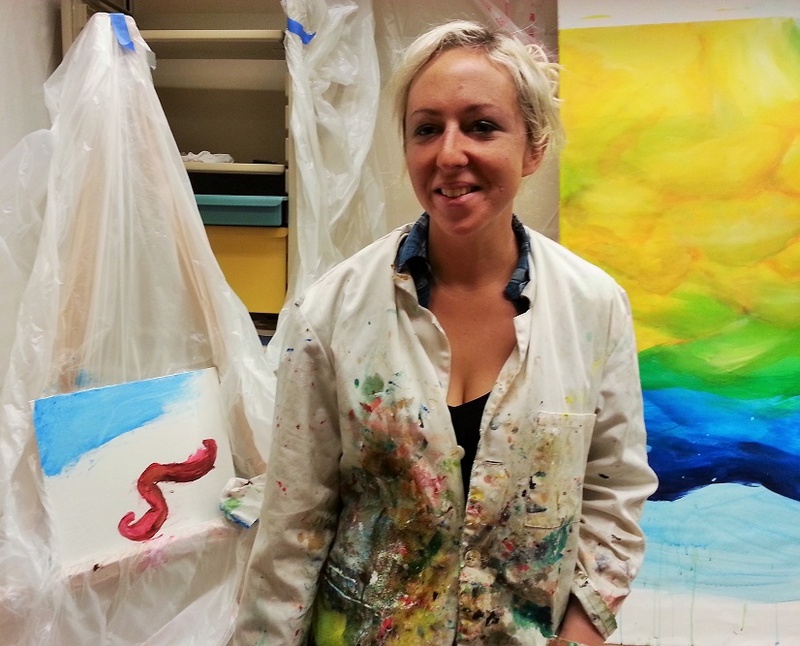 But this year, we also have a special grantee: Lily Simonson, resident artist. Lily dives herself to collect the organisms, which inspire the paintings that she creates on site in Crary. So what’s up in Mactown since I’ve been gone? Surprisingly, quite a lot. Neville the boiler inspector had his last day. He showed up at breakfast looking sad. We couldn’t bear to say goodbye, but Mike arranged an official certificate of appreciation. Then we heard tales of what happens over winter when someone hits the wrong button, and the whole station goes dark. The first thing you do is lock the door to keep out all the rubberneckers while you fix the problem. I must say, I’m glad it’s summer. In the galley, we met Christine–the Christine of the viral Condition One clip on Youtube. The other half of the Year On Ice couple, Christine told us “Ants” Powell was out filming somewhere, I believe the South Pole. The Powells hope to film a television series here. 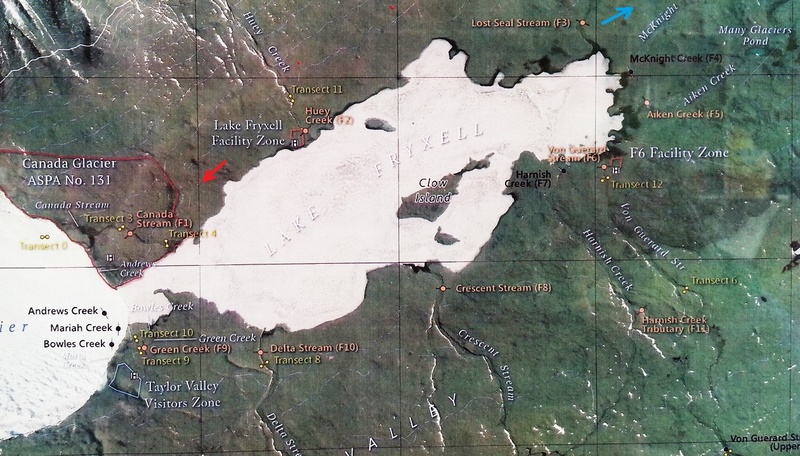 We heard that an ATV drove into the lake at Hoare, just outside the glacier where Rae told us the ice was thin. No one was hurt, but they got cold and wet, and a helo had to lift the ATV out. A congressional delegation is showing up Tuesday (the day after I leave) including key House members who led the sequester last year that laid off several hundred Mactown employees. Obviously they waited till I leave before they dare show up here. In their honor, a “voluntary” carwash was called, to freshen up all Mactown’s motley collection of vehicles. 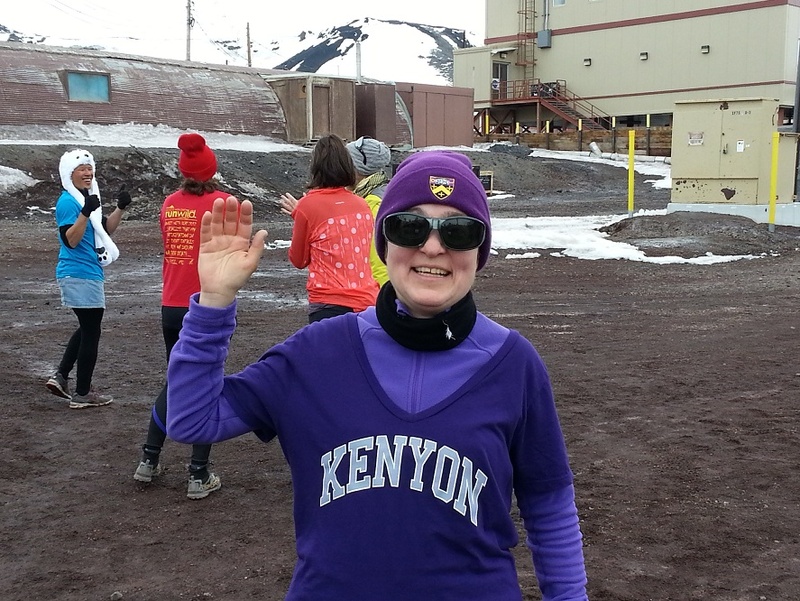 On Sunday I joined the 10 kilometer Scott Run. The temperature was 27 F, with no wind. Only one thing left for me do here: Try out for the Antarctic Fire Department. At the open house, the fire department showed off their vehicles. 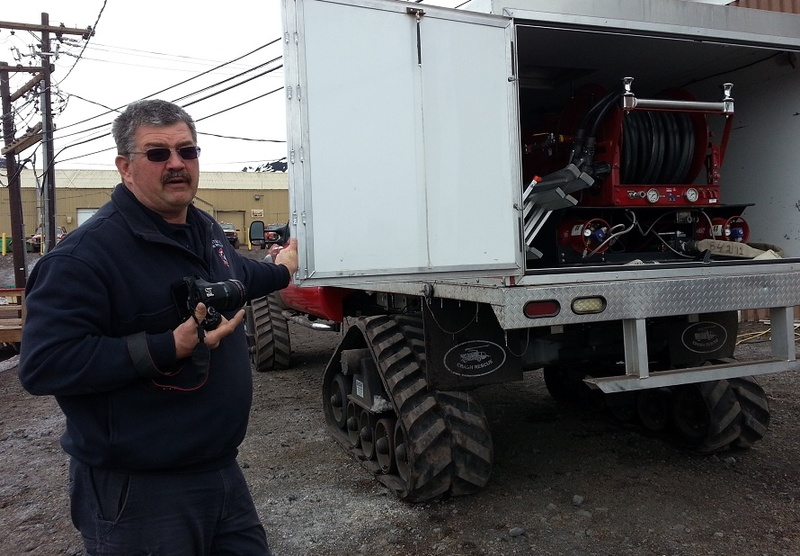 This unique fire truck has special tractor-tread multiple wheels, for driving across ice. It has been used to deal with vehicles engulfed in electrical fires. I also got to use the equipment to lift a incapacitated person out of a narrow spot such as a crevice in the ice. They have this neat four-pulley system that enables you to lift someone out. Then I got drafted into a training exercise of firefighters going into a smoking building. There was real smoke, and I wore the whole gear, from boots and mask to oxygen unit. We had to climb up a staircase and crawl into three rooms looking for victims. We finally found the victim lying under a bed, and had to pull him out by the legs. I must say, this last experience was the farthest thing from my mind when I signed up to discover microbes in Antarctica. It goes to show–whatever your adventure, keep your eyes open and expect the unexpected. How they gonna keep you down on the farm, now that you’ve seen McMurdo? Thank you for sharing your adventure. I shared it with my grandsons (7 & 10). Beautifully narrated and illustrated. I look forward to your sharing the results when your specimens are analyzed.